This weekend sees the Fourth Sunday of Lent, otherwise known as mid-Lent Sunday or Laetare Sunday, from the first words of the Introit Laetare Jerusalem (‘Rejoice, O Jerusalem’) from Isaiah 66:10. As Pope Innocent III said: “Today is the middle of Lent, so some relaxation ought to be provided, lest the faithful break down under the severity of their Lenten fasts”. To mark this juncture, we have arranged two special treats for the pupils. 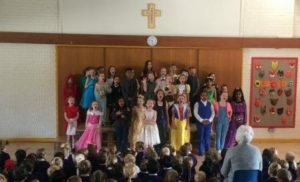 On Friday morning, children from the Drama Club performed ‘Every Panto That Ever There Was (in under 15 minutes)’, a showcase which took us on a whistle-stop tour of 18 pantomines in just a quarter of an hour! To raise money for our Lenten alms giving, children will be coming to school on Monday dressed in their own clothes to raise money for CAFOD, with the theme of ‘Wear it Wacky’ as it coincides with April Fools’ Day! It seems odd to be in the last week of the spring term just after the middle of Lent, but the children this coming week will all experience the Stations of the Cross. 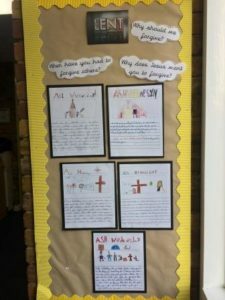 Year Groups R to 2 will have a Stations of the Cross service on Tuesday afternoon, then Year Groups 3 to 6 will take turns to visit the chapel at Oaklands Catholic School for their own reflections on Christ’s journey to Calvary. 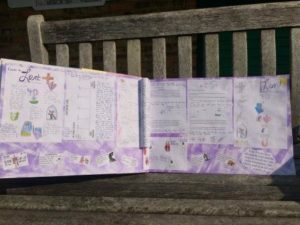 Below are examples of work the children have been doing in RE as part of their learning on the season of Lent.